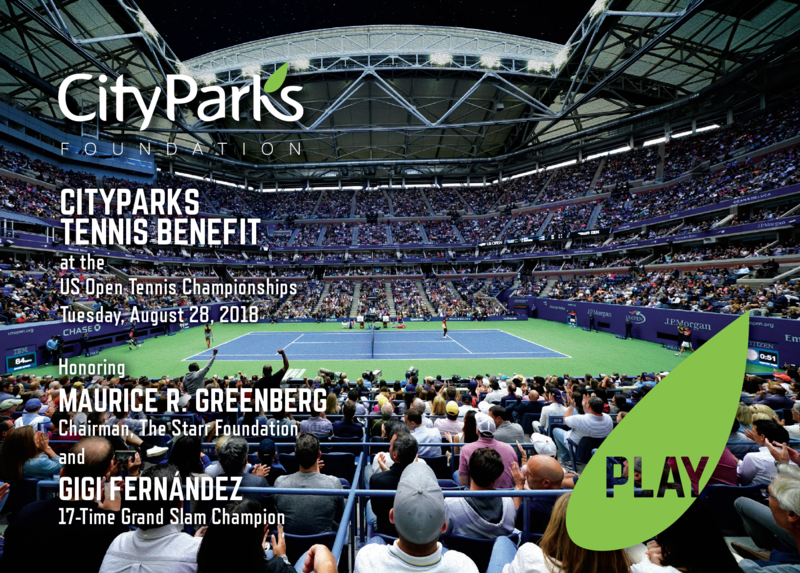 On Tuesday, August 28, 2018, City Parks Foundation will welcome guests to the US Open Championships to celebrate the CityParks Tennis Benefit. This year we proudly honor Maurice R. Greenberg, Chairman of the Starr Foundation and tennis legend, Gigi Fernández with the Vitas Gerulaitis Community Service Award. This benefit dinner helps CPF provide free tennis instruction to kids in more than 36 parks throughout the five boroughs. The dinner includes premium tickets to attend US Open matches in Arthur Ashe that evening. City Parks Foundation is proud to honor Maurice R. Greenberg, Chairman of The Starr Foundation and Chairman of Starr Companies, a global insurance and investment organization. Under Mr. Greenberg’s leadership, The Starr Foundation has grown to become one of the largest private foundations in the United States, making more than $3 billion in grants to support medicine and healthcare, education, human needs, public policy, culture and the environment since the Foundation was established in 1955. We are thrilled to present Mr. Greenberg with the Vitas Gerulaitis Community Service Award for his philanthropic commitment to improving lives in New York City, and especially for his support of CityParks Tennis, which reaches nearly 7,000 kids every summer, ensuring that free lessons and equipment are available to all. City Parks Foundation is thrilled to honor Gigi Fernández, one of the greatest doubles players in the history of the game reaching the world No. 1 ranking on her way to winning 17 Grand Slam doubles titles. A member of the International Tennis Hall of Fame and two-time Olympic Gold Medalist, she travels the country advocating for access to sports for all girls and shares her passion for tennis by helping kids develop the teamwork, communication, and sportsmanship skills that are the foundation of the art of doubles play. Dedicated to philanthropy and developing tennis in her native Puerto Rico, Ms. Fernández was named Puerto Rico’s Female Athlete of the Century and continues to head the Gigi Fernández Charitable Foundation which has donated more than a half-million dollars to charitable causes. Gigi Fernández embodies the ideals promoted by the CityParks Tennis program and we are honored to present her with the Vitas Gerulaitis Community Service Award. For further information, please contact Meagan Butler at (212) 360-8185 or events@cityparksfoundation.org. I am unable to attend, but wish to make a fully tax deductible gift to support CityParks Tennis. Submit ads as high-resolution, full color, PDF or JPEG files to Meagan Butler at MButler@CityParksFoundation.org. Ads must be received by Thursday, August 9th. All table and ticket purchases include entry to the cocktail reception, dinner, and evening matches in Arthur Ashe Stadium. We will make every effort to seat your guests together for the tennis matches. All gifts received by Thursday, August 9th will be listed in the printed program. City Parks Foundation is a registered 501(c)(3) organization. All but $250 of each ticket is tax-deductible. Donor Advised Funds may not be eligible for tickets or tables.